Just to the south of the A82 and at the east end of the village of Ballachulish are the fascinating and, it must be said, starkly attractive remains of the Ballachulish slate quarries, which employed up to 300 men at any given time for over two and a half centuries until 1955. Today the quarries have been opened up as a scenic attraction in their own right, and are well worth a visit. 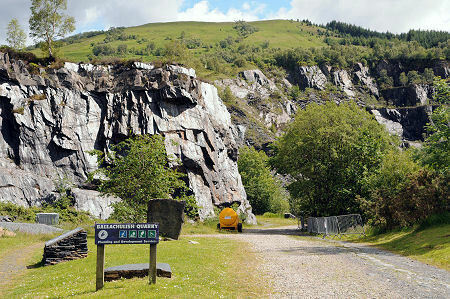 The entrance to the quarries are opposite the Ballachulish Visitor Centre, which is convenient as there is ample parking close by. 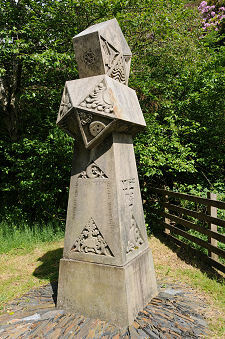 The story of slate quarrying in what was originally known as East Laroch began in 1693. This date has a certain resonance in the area as it is only the year after the Glen Coe massacre took place, a little over a mile and a half to the east. The quarries grew dramatically during the 1700s and slate from here was shipped out to provide roofing for Scotland's rapidly growing cities. 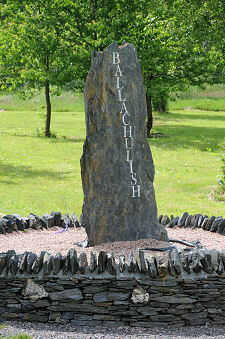 It is recorded that in one year alone, 1845, some 26 million Ballachulish slates were produced. The arrival of a branch railway from Oban in 1903 gave the quarries a further boost, as it made overland transport of the slates both possible and cheap. The Ballachulish Railway terminated at a station a hundred yards or so west of the quarries. Its arrival was, however, unfortunate timing in one sense, as a major industrial dispute was under way in the quarries at the time over the provision of medical care, which involved the workforce being locked out for a year. Further trouble flared up in 1905, but the quarries remained in business until finally closing in 1955. Ballachulish slate had one major drawback compared with some of its competitors. The presence of iron pyrite crystals within the slate meant that rust spots and holes were prone to appear in slates exposed to the weather, which of course is a drawback on a roof. 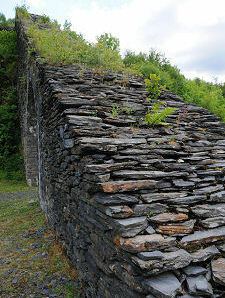 Because of this, only about a quarter of the slate actually extracted could be used for roofing, with the remainder finding less lucrative uses or being wasted. Today's visitor has a choice of two short walks, which between them reveal different aspects of the quarrying operation. The choice must be made at the entrance to the quarry, marked by a large sandstone obelisk. Why have a sandstone obelisk at a slate quarry? Well this one used to stand in Fort William's High Street until replaced by a bronze statue, and here is as good a place as any to appreciate it. One walk takes you into the main excavated area of the quarry itself, which is very slowly being reclaimed by nature. Here you can stroll along well made paths and view the excellent information boards. Slate's durability means that signs of the last quarrying can still be seen on and in the slate, with drill holes for blasting that never took place as clear as if they had been made yesterday. 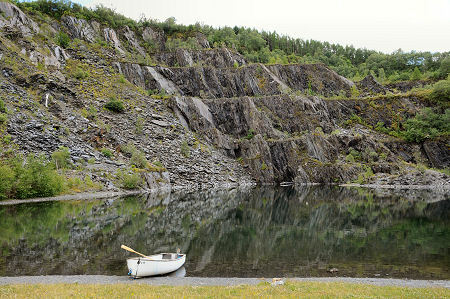 You can also enjoy the sometimes tranquil reflections on the surface of the two pools within the quarry. The second walk takes you 500m around the north side of the quarry and alongside (but well clear of) the main A82 to a spectacular arch and inclined plane. This was built in 1822 to allow slate from the upper levels of the quarry on the hillside above to be lowered 80ft. Here it was loaded onto wagons that were pulled by horse to the dressing sheds. As you return from the arch look out for the welcome sign and surround made from local slate, telling visitors that they have arrived in Ballachulish.